The unique ‘halfmens’ (Pachypodium namaquanum) and the endangered Baster Quiver Tree (Aloe pillansii) are conspicuous in the area, but one has to stop and look closely at the ground to see the myriad miniature succulents with the most surprising shapes and colours’ and even smartly camouflaged among the white quartzite pebble outcrops. But what are succulents? The name comes from the Latin ‘succos’ meaning juice and denotes a group of plants that have evolved various ways to survive its hostile environment. They are able to store moisture in succulent tissue that occurs either in their leaves, stems or rootstock, and are well adapted to temperature extremes. 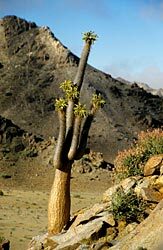 It is in the Richtersveld that the richest diversity of succulent flora in the world is found. Here, an exceptionally high diversity of succulents has evolved to fit the different micro-climates in inselbergs, sandy plains, quartz fields, shallow depressions, rock crevices, high mountain peaks, and steep gorges that compose the landscape.